In loving and affectionate remembrance of. Janet Henderson died 3rd October 1938 aged 76. Son George died 1905 aged 5. Son William Angus died 1905 aged 17. Son John Angus killed in France 11th April 1918 aged 28. Daughter Mary Angus died 4th September 1929 aged 41 wife of James Sutherland. 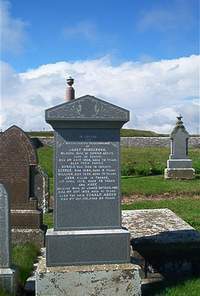 Husband Donald Angus of Roster died 8th October 1951 aged 89.